** Lower prices have dominated the CBOT this AM with corn, soybean and wheat futures down on technical and fund related selling. The bearish hangover from Friday’s USDA February report along with down trending charts has left the market with a void of buyers. US/China trade negotiations have not offered any new developments (its overnight in China), but the US dollar has shot upwards this morning which is creating a bearish landscape for a host of raw material markets. The USD has reached its best levels since mid-December with values trying to fill an open chart gap. The CBOT volume has been good on the break with funds shedding length and adding to their net short positions. Our view remains one that a bottom in the CBOT should be scored early this week as traders await developments in the US/China trade negotiations. Its US/China trade that will drive the CBOT in coming months. ** CBOT brokers estimate that funds have sold 1,900 contracts of wheat, 3,100 contracts of corn, and 7,000 contracts of soybeans. In soy products, funds have sold 4,600 contracts of soymeal and 4,100 contracts of soyoil. Funds have been sizeable sellers across the complex this AM. ** US weekly export inspections for the week ending Feb 7th were; 29.3 Mil Bu of corn, 39.1 Mil Bu of soybeans, and 20.7 Mil Bu of wheat. For their respective crop years to date, the US has sold 914 Mil Bu of corn (up 295 Mil Bu or 47%), 831 Mil Bu of soybeans (down 493 Mil Bu or 37%), and 565 Mil Bu of wheat (down 64 Mil Bu or 10%). China shipped 17.9 Mil Bu of US soybeans last week or 46% of the total. Non-US Chinese buyers are lagging well behind normal which would argue that WASDE is still too high with their 2018/19 US soybean export estimate by 75-100 Mil Bu. ** FAS announced the sale of 128,000 MTs of US HRW wheat to Nigeria and 120,000 MTs of US SRW wheat to Egypt during the 2018/19 crop year. Moreover, private exporters sold 120,000 MTs of US soymeal to Ecuador. ** The Russian Ag ministry met with exporters and held the same line as the December/January meetings. No restrictions are expected to be placed on old crop grain/wheat exports as the ministry is keeping its wheat export estimate at 37 MMTs and total grain at 42 MMTs. However, the Ag Ministry will seek to form a new exporters’ union that will help it control the pace of exports much like Ukraine. Each exporter will be allocated a hard quota for grain/wheat. The new Russian export structure will prevent the front loading of exports that occurred this year when the Russian wheat crop declined as exporters feared trade restrictions. ARC would note that interior wheat/flour prices rallied on the Russian news amid tight supplies and limited farm selling. 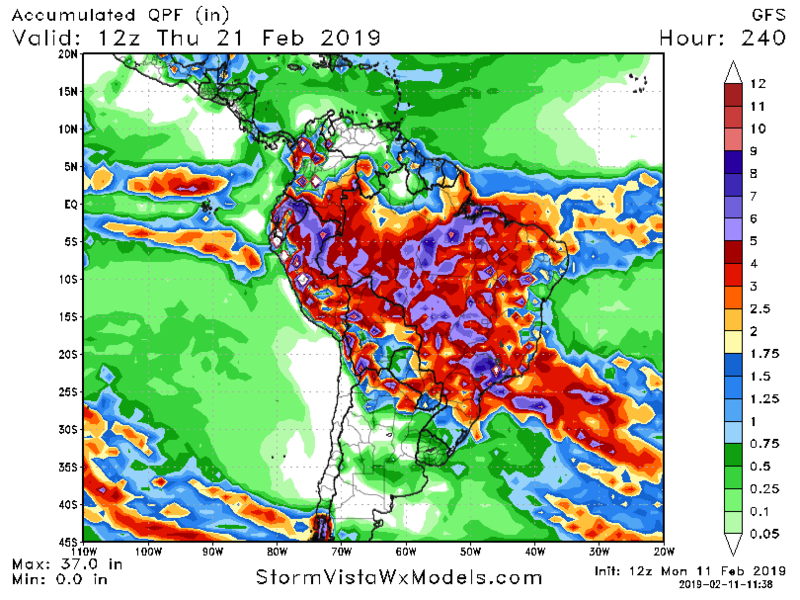 ** South American Weather Discussion: The midday GFS forecast reduced rainfall for Argentina in its 10-day forecast with limited rains of .15-.75” expected over the next 10 days. This is about a third of what is normal. No extreme heat is noted which will help preserve soil moisture. The Brazilian weather forecast offers near to above normal rainfall which should help replenish soil moisture. The Brazilian rains are more than adequate for the final weeks of the soybean and establishment of winter corn. ** AgResource Report Analysis: CONAB is out in the AM with their February Brazilian Crop estimates. CBOT corn/ wheat are back testing the lower end of their trading ranges which should hold. March soybeans could test their early 2019 lows at $8.91 as the Brazilian harvest advances. ARC expects positive news from US/China trade discussions to support late week CBOT rally. This is no place to sell grains.